blogsters guild: ACDSee Pro download: Photo manager better than Adobe Lighthouse? 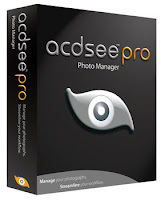 ACDSee Pro download: Photo manager better than Adobe Lighthouse? ACDSee Pro is a full featured photo manager for serious photo enthusiasts, that enables you to view, process, edit, organize, catalog, publish, and archive your digital photo collections. It supports image formats from most DSLR cameras and allows you to process, edit and adjust your RAW files. You can organize your images into categories, assign keywords and ratings and more. The program fully supports IPTC/EXIF/XMP metadata. Other features include advanced search options and filtering by EXIF data, photo sharing via e-mail, web galleries and slide shows as well as CD/DVD archiving. Adobe Light house!! Watch out. Here's ACDSee Pro! !